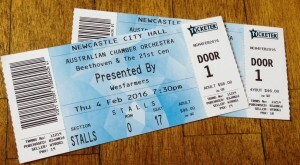 In January, I turned 28 and Poopsie gifted me with tickets to the Australian Chamber Orchestra (ACO) Collective who were performing in Newcastle on the 4th of February. 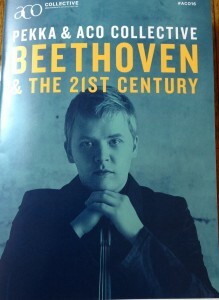 As I love classical music, this was the perfect gift for me. The performance was called Pekka and ACO Collective: Beethoven and the 21st Century. The musicians were led by Pekka Kuusisto, the ACOs Artistic Director. Described as a “flamboyant Finn” in the program, Pekka brought some fun and playfulness to the evening. Eight pieces were played in total. The final piece was Beethoven’s Opus 95 ‘Serioso’. The pieces preceding it were selected to build up to this final performance, complimenting it nicely. The pieces selected were a mixture of old and new, with a number of contemporary compositions pairing nicely with more classical ones by the likes of Michael Tippett and Jean Sibelius. The ACO Collective is a 17-piece string ensemble that conducts the ACOs regional touring and education program. It is a mix of some long-time members of the ACO as well as a wide range of young musicians just starting out on their careers. I did notice, prior to learning this, that the musicians on stage were all very young. There is absolutely no degradation of quality though, their youth and enthusiasm providing for wonderful music. While I am a big fan of classical music and have seen the ACO perform a number of times, I would certainly not describe myself as being particularly knowledgable regarding what I am listening to. I always find the free programs provided at the performances to be an excellent source of information. It tells the story of what you are hearing and the reasoning behind each careful selection of music. These programs help me to better appreciate any performance by the ACO. We had a wonderful evening. While it wasn’t sold out, it was clearly popular amongst the Newcastle crowd. If you live in one of the major cities of Australia, I highly recommend attending a performance of the ACO. If you live in a regional city, definitely check to see if the ACO Collective are coming- you won’t regret it. Cost: Poopsie’s ticket cost $98. The ACO, in an effort to encourage young people to attend, offer deeply discounted tickets to those under 30. As such, my ticket was only $46. I did have to show ID when collecting the ticket though, so bear that in mind. For more information about the ACO, visit their website and book a performance where you live. 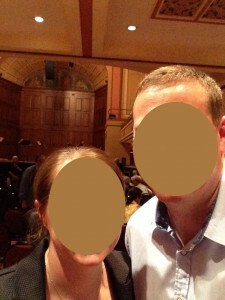 What cultural events have you been to lately? I was lucky enough to catch La Verita as part of the Sydney Festival recently. Not something I would have initially sought out, however someone from work recommended it, so a group of us got together and went out on a “school night”. It was fantastical. The strength, grace, and multiple talents of the performers literally had my jaw hanging at one point. It wasn’t just the beauty, though – it was also a very funny performance! I don’t know anything about the group, or if they are likely to come back, but highly recommended. I can’t imagine anyone that wouldn’t appreciate it. Good win for you with the ticket pricing! Wow, that sounds awesome. I love when you go to something, not really knowing what to expect and end up absolutely loving it. I agree, I know a lot of people who claim to not like classical music but then when they see a live performance, just love it. It’s so wonderful.